"You guys have no sense of adventure." Just when I thought this series couldn't get any weirder, the thirteenth outing ups the ante once again. If you are just tuning into the series, this long running comedy comes from the mind of Rumiko Takahashi, as the precursor to hits such as Maison Ikkoku and Ranma 1/2. Able to put a bizarre twist on just about anything, Urusei Yatsura continues the misadventures of the skirt chasing Ataru Moroboshi and his alien wife Lum, constantly on vigil against her husband's roving eye. Whether it's transdimensional or time travel, or visits from the cast of aliens, vampires, ghouls, or other beings, there is always some mischief to be had in this whacked out series. Things start off with the gang on an outing to an archaeological site, where they discover a wealth of prehistoric fossils, and begin trying to reassemble them for fun. Meanwhile a team of journalists is nearby, trying to create a documentary, but are not expecting what they will find, especially when Lum brings Ataru's fossil bird to life. Next, Princess Kurama returns after deciding to nullify her original attempt at a mate, and return to the deep freeze. Her Goblins are set to the task of trying to do better for her the second time around, but as luck would have it, when Ataru once again awakens the sleeping beauty, the Goblins try to convince Kurama it was Mendou, sparking a rivalry between the two young men for the honors. Ten has a toothache, and his discomfort pleases Ataru to no end, to which helps out by tormenting the little alien as much as possible. However, there's something Ataru is unaware of about Oni toothaches�they are contagious�and the only cure is to bite seven other people and infect them. When the infection reaches the classroom, all hell is about to break loose. The final installment introduces Mendou's younger sister, Ryooko, whose sole purpose in life is to annoy her brother. After showing up at school with Mendou's lunch, and announces that she is the boy's fiancée (causing panic amongst his legions of fans), Ryooko discovers Mendou's biggest thorn in the side�Ataru�and promptly invites young Moroboshi over to the family mansion for some Romeo and Juliet-style role playing. This collection is pretty fun throughout, with perhaps the toothache episode being the weakest of the batch. The opener is as off the wall as they come, and any Princess Kurama installment is bound to be a blast, and this one is no exception. Ryooko proves a nice addition to the cast, and Ataru's enthusiasm to play along with her intentions is highly amusing. This isn't a series for those with an aversion to silliness, as it is in abundance here, and aside from keeping some of the most prominent characters straight, is pretty easy to pick up on the run. There continues to be something new thrown into the pot with each outing, and the well established character traits continue to interact in a decidedly hilarious fashion. Image Transfer Review: Image quality is consistent for the series, while containing a few age related defects, the overall presentation is strong. Colors are vibrant, but with a bit of bleeding in places, and black levels solid. Rainbows were pretty much nonexistent, grain is evident but only excessive in deep blues, and aliasing is minimal. Credits still have ghosting present, but this doesn't affect the rest of the show too badly. Audio Transfer Review: Japanese mono is the only audio option, and the track is as well presented as could be expected. Dialogue is clear for the most part if slightly over sibilant, there is some edginess and distortion in places, and hiss is audible but not excessive. For a show this age, it fares well. Extras Review: The lone extra is the set of liner notes included in the case, pointing out some of the cultural references and puns used in the show. A blurb on Ryooko is on the back cover. 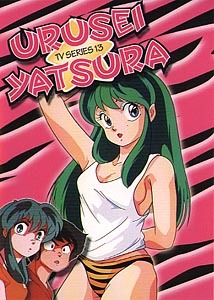 Disc number thirteen brings another four bizarre installments of Urusei Yatsura, and a new character to add to the mayhem. Easily on par with the humor of previous discs, so if you have enjoyed what you've already seen, this set won't disappoint.